I had heard this word, Saki-ori, before, but I never quite took in what it is. 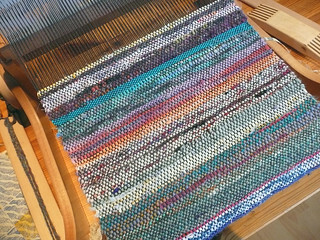 The Japanese tradition of creating new cloth from old cloth, weaving with thin strips of worn fabric. 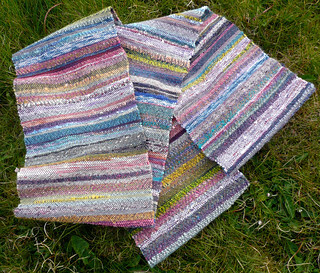 Akin to rag rugs, but on a fine scale, soft enough for clothing. … I knew I would come back to this, one day. Find out more. Take it further. 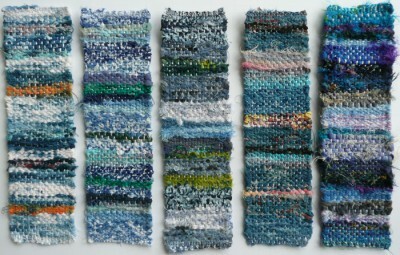 A long time ago, I stitched connections between the fabrics I’ve worn and worn out. Three weeks ago I met a woman who will never buy any clothes again, ever. 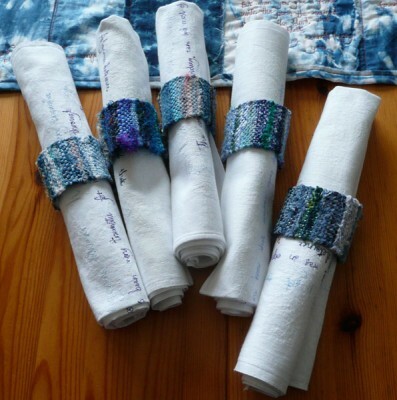 Then, I read the year of enough by Joanna of Things[HandMade]. Yesterday, sorting out supplies for a feltmaking day I’m leading next week, I felt drowned in everything I’ve amassed, such quantities that I hardly know what I have. There’s so much going on in my head right now I think I may fly apart. 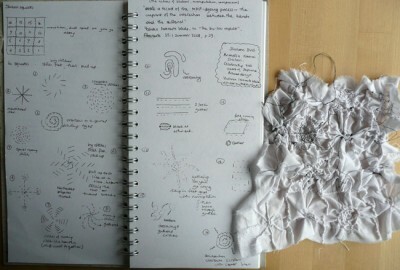 But I hope that the quiet discipline of cloth will hold the fragments together. Sakiori is here, here, here, and here. And here, along with many other wonderful stripes and strips. 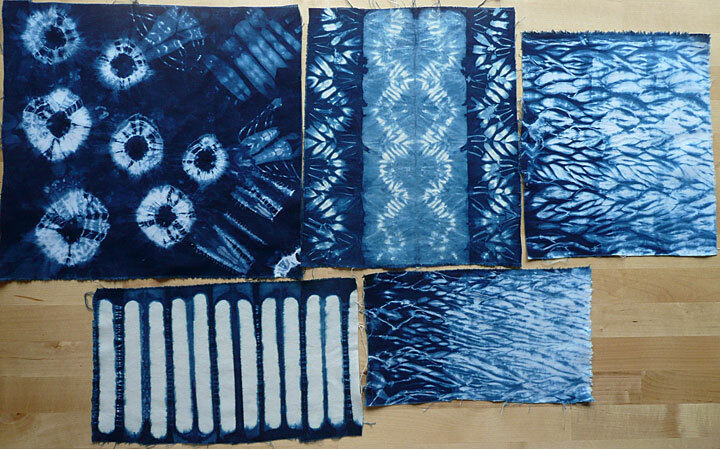 On Saturday I finally got to dyeing the stitched samples I’ve been making as experiments with fabric manipulation and shibori patterns. I decided in the end to go with Procion dyes, because I have all the ingredients to hand already,Â and I didn’t want to be experimenting with the dyeing part as well (although I ended up mixing methods in a bit of an ad hoc way, even so). 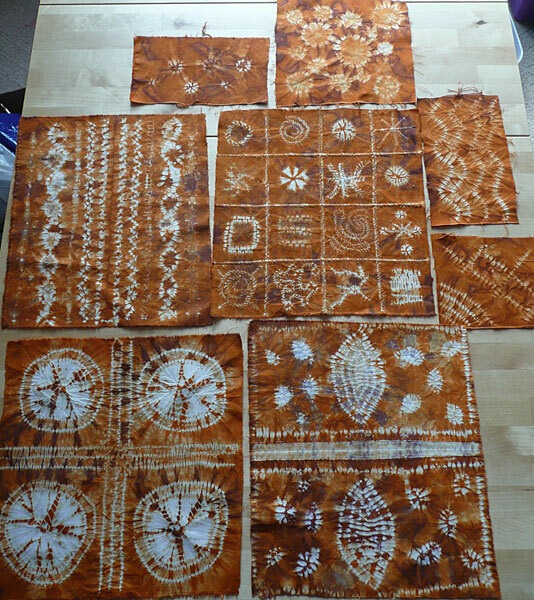 I soaked the stitched samples for half an hour in soda solution, then mixed up the dye – I was aiming for a rusty colour and I followed a suggestion in Tray Dyeing (by Claire Benn and Leslie Morgan) – 1 part Golden Yellow, 1 part Scarlet, 1/2 part Turquoise. It looked a bit brown so I added a little more of the red and yellow. I mixed it in a small bucket with salt solution and warm water and in went the samples. Then half an hour later I got cold feet about using a single colour and decided to tip the lot into a tray and splodge a bit of Marine Violet over it for good measure! I wrapped it in towels as it’s a little chilly here and left it for about 6 hours before rinsing. 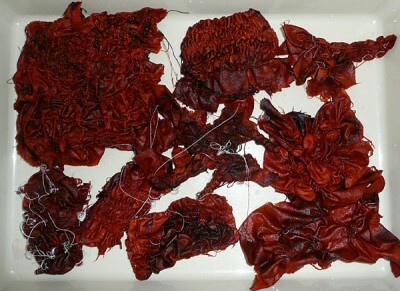 At that point the samples looked so solidly dark I couldn’t believe that the stitching had actually resisted – I was quite prepared to open them up and find that the dye had seeped all the way through. 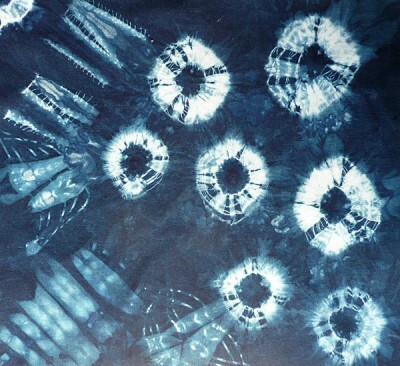 But no, like magic, when the threads were snipped and unravelled there were patterns within! Unstitching the bundles took some time, and I’ve learned that it is not sensible to use a cotton thread that will end up the same colour as the fabric, and especially don’t do this when you have used overstitching and can’t just pull out the thread in one go! White (and even black) polyester thread was easy to see and much easier to remove. 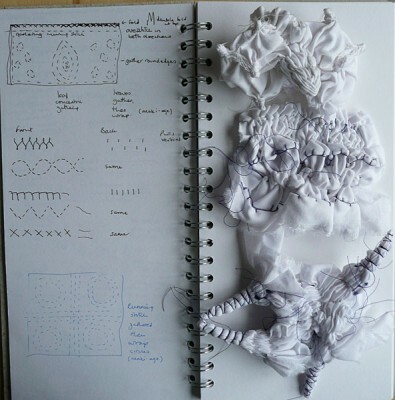 I was glad of my small sketches of the original stitching – I knew I’d have forgotten by this time how I had made the different patterns. 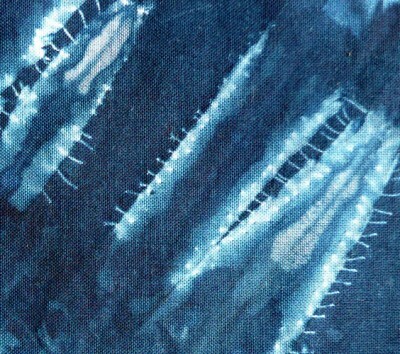 I like the wrapped effects, but I’m especially enchanted by the ghosts of stitches that are no longer there but have left their trace on the fabric. I’ve uploaded more pics to Flickr, showing each of the samples on its own. While we were at Land’s End we sat for hours one day in the camper van while the rain poured down outside and I stitched some experiments to add to my little pile for dyeing. 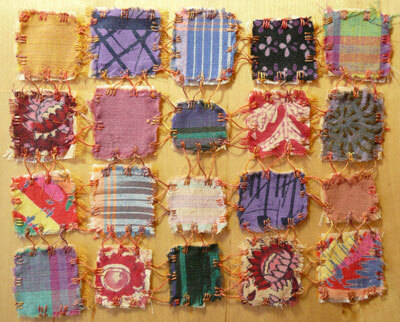 I made a square of squares, first overstitching a grid and then a different idea in each small square. In a fit of unusual methodicalness (or maybe all I need to be methodical is some dedicated time… ) I drew the stitch pattern for each square in my sketchbook so that if I like some of the results I can remember how I did them. I broke the thread a few times, which was very frustrating, and reminded me I wanted to get hold of some ‘seriously strong thread’ from Callishibori – I’ll put it on my list to look for at the Knitting & Stitching Show. 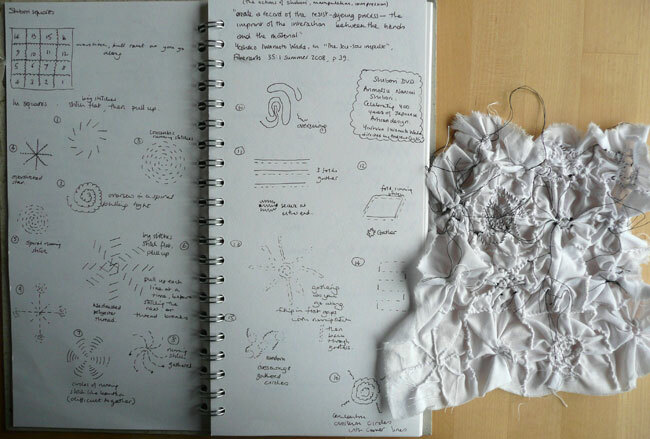 I used ordinary polyester thread and I ran out of white – I’m sure I will regret the black when I come to unpick it! The rest of the samples include some embroidery stitches pulled up tight and my first try at maki-age, stitched and bound resist. I haven’t decided whatÂ to dye these with yet. 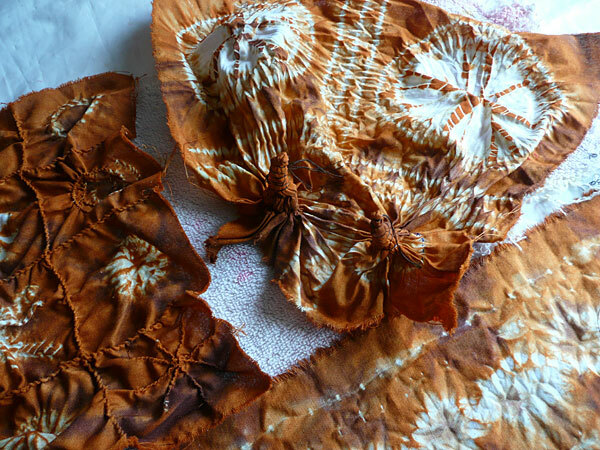 I’ve been thinking more about the environmental effects of different dyes and mordants recently, partly because we’ll be on a septic tank when come November, partly as I’m (slowly) reading Eco-Colour, India Flint’s beautiful and thought-provoking book about using locally sourced materials for dyeing. 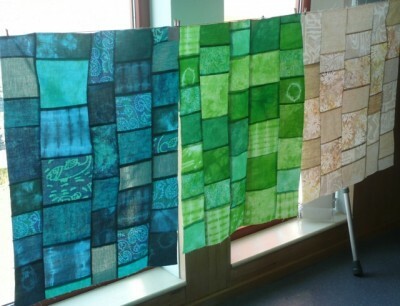 At the moment I feel that I couldn’t change to only using plant materials but I would like to gradually use more of them (though moving to the windiest place in Britain may not help with the locally sourced part!). 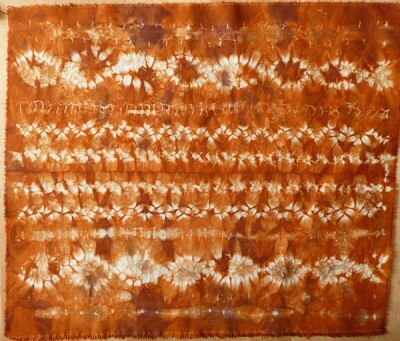 By the way, I found a very interesting and inspiring blog while reading round this subject on the web, Robin Paris’s Sustainable Batik, and another I’ve been reading for a while is Helen Methven’s Growing Colour. Lots of food for thought. 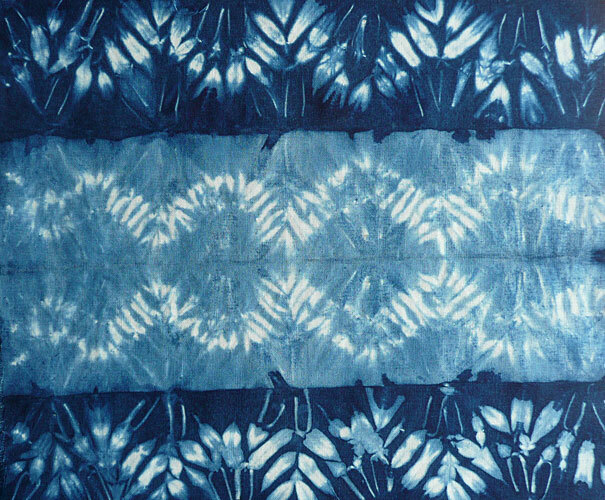 There were some coloured dyes at the "Kendal Green meets Shibori Dyeing" workshop this morning (with Donna Campbell at Kendal Brewery Arts Centre) – but there was an indigo vat too, so I just used that – too good a chance to miss. The workshop was only two and a half hours long and went all too quickly but I came home with five samples and I’m pleased because I really tried to plan the way I tied and folded the cloth and I like most of the results! The only one that didn’t really do what I wanted is the striped one, which was concertina folded with lolly sticks and then wrapped. I was hoping the lines from the wrapping would show up on all the blue stripes – I think I should have left more of the fabric sticking out of the resist. I didn’t take along my fabric manipulation experiments in the end, I’m going to dye those at home later on. I especially liked this effect which was from making three small pleats in the fabric and overstitching through all the layers. 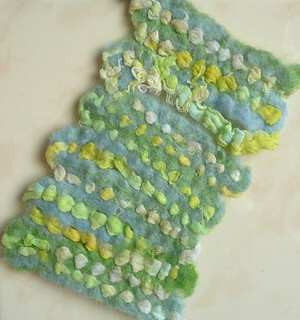 And this, which is a combination of paper clip clamps and a wave pattern gathering stitch. One thing I learned is that it’s much easier to gather the fabric well with a proper strong thread sold for the purpose. 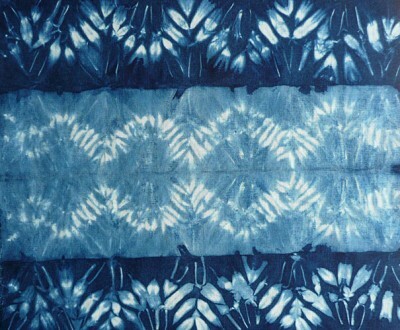 The one we were using had come from Callishibori as had the indigo. 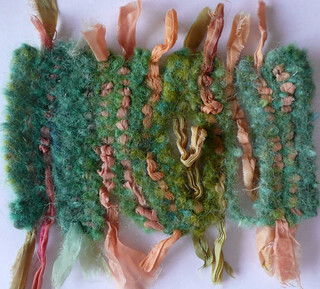 The Motto festival of which this workshop was a part is on in Kendal till September with lots of textile workshops and events at the Brewery Arts Centre and in the town.